It’s a common worry. Am I spending more than I should? When are my bills due? Have I paid them? Am I on track to reach my financial goals? Am I going to be able to get out (or stay out) of debt? Financial worries are not only one of the greatest causes of personal anxiety; they can also be one of the biggest strains on a relationship. Many people don’t have their finances well organized and therefore aren’t able to tell where they stand. Disorganized finances can have severe consequences; In the short-term, you may end up paying hundreds of dollars in late fees and penalties. You may be digging yourself deeper into debt without even realizing it. In the long-term you won’t meet your high-level financial goals. Couples often end up re-hashing the same financial issues over and over again because they don’t have a way of tracking the decisions and progress they’ve made as a result of their arguments…er discussions. If your finances are not organized how can you ever have any hope of getting them under control? The good news is that by taking one simple step you can start down the road of financial security and begin to get your finances in order. You can get a good overall view of your financial picture and establish a base from which you can build your financial future. It all starts with creating your financial binder. What is a financial binder? A financial binder is a place to keep all of your high-level financial information including important decisions and goals you’ve made. Instead of containing transaction-level, detailed information about your finances, it is a place for summary-level information about such things as bank accounts, bills, financial decisions, savings goals, taxes, and credit reports. Your financial binder doesn’t necessarily have to be a binder. Any form of organizing papers into categories could technically work. However, there are certain advantages to using a binder. Binders are easy to expand. You can always add more tabs or upgrade to a larger binder (up to 5 inches). Binders are easy to customize. You will inevitably want to create categories and information unique to your situation. 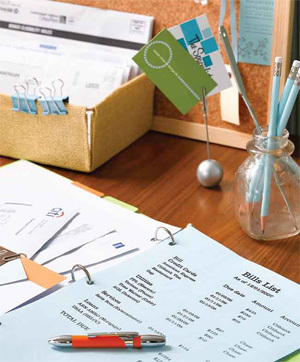 A Binder keeps items in one place and prevents them from getting misplaced. Binders are portable. My wife and I sometimes like to review our financial progress during quarterly getaways. Being able to take our binder and go makes it easy to conduct these remote reviews. Many people ask why they shouldn’t keep their binder information in digital form. Although your binder is paper based, many of the contents may be created digitally. Simply take the last step of printing out the documents after you work on them and you’ll have a nice backup. Whenever you print a document, be sure to record both the date printed and the digital location of the file for later reference. While digital files do have advantages I discourage the use of exclusively digital storage for the following reasons. The “did I change this?” factor. By printing out a hard copy of digital files, you put a stake in the ground so to speak. You establish that “on this date, I made this decision” rather than second guessing if you’re looking at the most recent version of a document. Backup. If you haven’t had a hard drive crash on you yet, it’s just a matter of time. Most people don’t have adequate digital backup plans. Here’s a handy tip: To make it easy to cross-reference your paper and digital files, alter your Microsoft Word or Excel settings to automatically print the date-printed and the digital location of each file. In either program, from the menu select “View — Header and Footer.” You can then configure exactly what you want to appear at the top and bottom of the page. You may have to play with this a little to get exactly the effect you want. What should a financial binder contain? Ok, let’s get the big one out of the way first. Even though your net worth statement will probably only be less than a page long, it needs the most explanation. A net worth statement is the best way to track your overall financial progress in one quick view. It simply shows all of your assets minus all of your liabilities. If you’ve never created a net worth statement, don’t make it too complicated at first. Start with just the basics at first and you can make it more detailed over time. List all of your assets, one per line, along with the value for each. For your first version, just list your bank accounts, investment accounts, and a rough estimation of how much your house is worth. If you have no idea how much your house is worth, just put down the amount you paid. Every time you update your statement, make an improvement – add the value of your cars, refine the calculation of the value of your home based on other houses for sale in your neighborhood, or start adding possessions that have significant value such as jewelry or electronics. Adding your possessions provides a nice side effect – it can act as a record for home owners insurance if items are damaged or stolen. You can use online services to refine the value of your assets. Use Yahoo! Auto (auto.yahoo.com) to estimate the value of your vehicles. Zillow.com will give you an estimated value of your house (accuracy can vary wildly so you may need to do a gut check) or you can use RealEstate.com to find the asking price for similar homes in your area. Search for possessions on eBay.com to see what the market price is for similar used items. Once your list of assets is complete, sum the individual amounts to show your total assets. Next calculate your liabilities. For most people this will simply be a list of your debts. List each liability – each loan, for example – and the amount on a separate line. Sum your total liabilities. Now subtract your total liabilities from your total assets and, voila, you have your net worth! The higher the number the better. Hopefully it’s not negative. This is a valuable report to keep because you can see your progress over time. Sometimes it’s hard to feel like you’re making progress, even if you’re saving or paying down debt aggressively. Your net worth statement shows the concrete effects of your efforts. You should update your net worth statement at least once every quarter (three months) but if you’re financial situation is in a state of flux, update it monthly. Every time my wife and I discuss and finalize our budget each month, we print it out, sign it, and file it in our financial binder. This may sound a little strange but it’s amazing how this helps us avoid arguments in the future. It’s too easy otherwise to second guess if this was really the budget we’d talked about. Having a list of previous budgets easily on hand makes it much easier to plan for future months or compare if expenses have gone up or down over time. Keeping an updated list of all your accounts is a great reference tool. I’m always amazed how easily people forget that they have open accounts they forgot about. This list will help keep your accounts up to date. It’s also a great place to list your usernames and passwords for each account. The name of the company the bill is from. When each bill is due. Be sure to list if the bill is due on the same day of each month (the 15th of each month) vs. every x weeks (every 4 weeks). The amount due for each bill. If the amount varies from month to month, list the range – the maximum and minimum you’ve had to pay in the past. How each bill is paid. Do you pay with cash, check, credit card, or using a direct bank transfer? If you pay the bill with a check or bank transfer, list the bank it’s paid from. Usernames and Passwords for each account (if applicable). This is where most of the customization will take place. List anything you think is important. Whenever you have a financial discussion with your spouse, take a couple of extra minutes and write down what you talked about or decided. This will keep you from having the exact same conversation over again. Writing it down doesn’t mean you can’t change your opinion, but will simply act as a starting point for future discussions. These should be three separate sections. These may take the form of simple lists or more involved calculations (e.g. planning vacation expenses). We often keep lists of our savings goals in excel spreadsheets and then print them out for the binder. This allows us to easily make changes and calculations as we alter the lists. Short term goals would be things like household purchases typically under $300 or things that might take a few months to save for. Our list of short-term savings goals is the longest of the three and includes just about everything we want. It’s really our wish list of household purchases. When we have a little extra discretionary income, we’ll typically refer to this list to determine what to buy. This list also changes the most of the three. We commonly add and subtract items. Medium term goals are items over $300 including things like vacations or items that take less than 5 years to save for. We also include in our medium-term list things like furniture and gift giving. In fact, we break down all the people we want to give to throughout the year and how much we want to spend so we can ensure we have the money budgeted when it’s needed. We do the same for vacations, breaking each vacation down into travel expenses, lodging, food, etc, so we know how much to budget. We typically refer to this list when we have a windfall such as a larger tax return or bonus. Long-term goals are things that take over 5 years to save for including things like retirement and college savings. If your insurance companies provide you with summaries of your coverage, use those. If not, try to summarize on your own how much coverage you have in each area. Include all types of insurance including health, disability, dental, life, auto, and home-owners. This may be one of the toughest sections to flesh out. I must admit it’s where my financial binder is most lacking. If you’re not sure how much coverage or what type of coverage you should have, a certified financial planner should be able to help. If your tax preparation software or accountant provided you with a summary of your tax return, keep it here. You could keep your entire return here if it’s not too large. Keep the most recent version of your credit report from each of the three major agencies: TransUnion, Equifax, and Experian. By law you are entitled to one free report a year from each company. To get your free reports, visit www.annualcreditreport.com. Your financial binder is such a great tool to help you get your finances under control, but it also can pose a risk. Having all your summary financial information in one place can make it easy for snooping eyes to see things they shouldn’t. Keep your financial binder in a safe place – a locked drawer or, even better, a fireproof safe. Getting started organizing your finances isn’t hard. It just takes consistent effort over time. Don’t try and enter all this information at once. Do one thing a week…or even one thing a month. The most important thing is to get started TODAY! Take one simple action – if you don’t have a binder, tabs, or a labeler, go buy them. If you already have the materials, put in the information that’s readily available to get started. Every time your review your finances, add one more thing. You’ll often find that taking the first step is the hardest, then you’ll be naturally compelled to take more as you start to get financial clarity. Get started today down the road to financial control. This article was originally written for Organize Magazine. A shortened version of this article previously appeared in Organize Magazine. A while back I attended a FranklinCovery “4 Disciplines of Execution” workshop for my work. It’s a brand new training course and our company, being located in Utah close to FranklinCovey, was chosen as a test group. They brought up some very interesting points about the most important measures for determining success in reaching your goals. As I went through the training I could help think how these concepts apply to personal finances. One of the major distinctions they made in the training was between lead and lag indicators. These are measurements you can track that help you achieve your goals. A lead indicator is something that can be tracked and acted upon in the moment and that predicts the outcome. A lag indicator is something that can only be tracked after a result has been achieved. Lag indicators don’t predict an outcome, but rather show the results of an outcome that has already occurred. The main point here is that a lead indicator is also something you can control in the moment whereas a lag measure is something you can’t control because it’s already happened. Confusing? Here’s an example. Let’s say your son has a goal to save $5 for a toy at the end of the month. In this situation a lag indicator would be how much he saved last month. It already happened and can’t be changed. It also won’t predict how much he’s going to save this month. In other words, it can’t be acted upon. On the other hand a lead indicator could be how much he puts in his piggy bank every day. This is a measurable indicator that your son can influence and act upon and will predict how much he has saved at the end of the month. As you can see from this example, it’s important for us to identify the lead indicators for reaching a goal because they help us act and to achieve the goal. So how does this apply to personal finance? I often see people using lag indicators to try and predict future performance within their finances. For example, how many of you have wanted to figure out what you are going to spend next month on groceries by looking at expenses from last month? We’ve all done it and yet that is a lag measure. How much you spent last month may have nothing to do with the expenses you’ll incur next month. Further, you can’t act to change what you spent last month. Looking at your finances this way is almost useless in helping you curb future behavior. Instead, what are some lead measures that could help you predict next month’s grocery spending? What measures will help you achieve a goal of spending a certain amount and no more? There actually could be many different lead measures, but let me suggest a few possibilities. One lead measure could be how many times you go to the store every week. By going to the grocery store less you may spend less which would help predict how much you’ll spend by the end of the month. This probably wouldn’t be the most effective lead indicator, but it’s a start. Another, slightly better lead measure could be creating a spending plan for your groceries. By outlining how much you’re going to spend on what, you can predict what the total expense will be and such a plan will influence your behavior. While this is a much more effective lead measure and will be more highly predictive of the final outcome, it would require a lot of time and work. Probably my favorite lead indicator for how much you’ll spend on groceries next month is how much cash you take out to spend on groceries. Of course, this assumes you are exclusively on a cash basis for groceries and that you wouldn’t purchase groceries on a credit card. If you take out $400 for groceries and only spend that cash, you have a perfect lead measure that predicts you will spend $400. Cash serves as the perfect feedback loop. Once the cash is gone, it’s gone. Cash is also a great lead indicator because it can influence your behavior in the moment. If the cash is running low, you may reconsider purchases or decide to purchase some items next month if you don’t really need them yet. In contrast, let’s look at using credit cards to measure spending. Many people would consider using credit cards to be a lead indicator because they can look up their account at any time and see what they’ve spent. However, using a credit card in this manner is NOT a lead indicator. Instead it’s what they call a “quick lag.” A quick lag is something that can seem like a lead indicator, but has already occurred and can’t be influenced. The best comparison is someone trying to lose weight. It may seem like weighing yourself daily is a lead indicator, but it’s actually a “quick lag.” Why? When you weigh yourself, you can’t immediately change the results. There is nothing actionable about weighing yourself. Your weight is the result of decisions you’ve already made and can no longer control. Looking at your credit card spending at the end of every day is the same way. You can’t go back and change what you spent. Your spending is a lag indicator showing what has already happened and it can no longer be acted upon. Now I will agree that if someone were to look up their account before every purchase to see how much they’d spent in a certain budget category, it could be a lead measure and could influence behavior in the moment. But that is not a common behavior nor is someone likely to go through the hassle of doing so. So how do you create your own lead indicators to help you reach your financial goals? There’s no one clear answer to this question. Identifying lead indicators can take some creativity and can be a fun process. Here are some guidelines that will help. Try looking at the measures you use to control your finances and see if they are lag or lead indicators. Can you change or improve them to be more effective? What behaviors or actions are predictive of how much you spend? How much you save? By re-evaluating your system within the framework of lead and lag indicators, you may have some useful insights that will help you achieve your goals more quickly and easily. What measurements do you use? Leave a comment and share what measures have worked best for you. If you have children, saving for their college education is probably among your financial goals. Today, the average tuition at a private college is over $22,000. Refinance the house? Dip into retirement? Not according to Anne Marie Chaker at the Wall Street Journal Online. Her article Seven Myths About College Finances debunks several assumptions people are likely to make if they don’t look deeper into college financial aid. Myth 1: Financial aid means grants and scholarships. Truth: Financial aid includes scholarships and grants (don’t have to be paid back) as well as federal loans. Loans can be subsidized and unsubsidized, but either way there is a cap on the interest rate–saving big bucks over the long term. Some jobs after college offer loan-forgiveness programs. Myth 2: My assets (home and retirement savings) will prevent me from getting a need-based loan. Truth: The home you live in and retirement plans are not included when determining how much aid you can get under federal rules. Private colleges may use a separate formula, but do not include retirement savings. Myth3: I should go with the lender preferred by my college financial aid office. Truth: Shop around and read the “fine print.” What looks like a good deal upfront might include an origination fee, or heavy penalties for missing a payment. Myth 4: I’m doomed if I have two kids in college at the same time. Truth: You are likely to qualify for more aid. Myth 5: The federal aid process follows a strict formula and my situation will never be given special consideration. Truth: College aid officers have the authority to make adjustments on a case by case basis. Documentaiton will be required. Myth 6: Our child is likely to receive many private scholarships. Truth: Nearly all financial aid officers agree that parents overestimate the amount of scholarship and grant money children will receive. Myth 7: The 529 college savings plan is bound to be the best for me. Truth: Shop around–be sure to look at fees. If you are researching college financial aid, be sure to check out this post by Anna Leider. After reading these articles, my biggest question is: Have parents always footed the bill for college? It never occurred to me to ask my roommates how they were financing their education; I only know that at least half of them worked. My parents paid my first year of room and board, but after that I was on my own. Just the idea that they would have used their retirement or refinanced their home to pay for my education seems crazy to me. Has a college education become an entitlement? Even at the expense of the parent’s financial future? We live in a land of opportunity, and some believe that our country stays strong because life isn’t handed to us on a plate. We believe in hard work, and the self-made man. By giving our children everything, do we rob them of the chance to struggle, work hard, and fulfill their potential? Today I went to lunch with a very wealthy person. I don’t know exactly how wealthy , but based on his frequent trips to Maui, the fact that he earns a free plane ticket every month through his frequent flier points, and the fact that the other day he decided to go out and buy a truck just because he’s never had one before, there’s good reason to believe he’s close to a seven-digit earner. As I talked with him, it raised a lot of questions in my mind about how managing my finances will change as my wealth grows. If I were a millionaire would I still need to budget? Would I still want to track all my spending? Would I still need to negotiate with my wife about finances? It seems logical that with an income over $1,000,000 a year you wouldn’t need to plan as vigorously. But in the end thats a lie. Millionaires that manage their money irresponsibly can quickly lose it all and fall from grace (MC Hammer comes to mind). Financial management principles are the same for millionaires and low-income-earners alike. Certainly the numbers your dealing with will change, but the basic principles and processes are still the same. In fact, by following sound financial management principles and optimizing your frame of mind, you can accelerate the process of building wealth and know how to keep it when you arrive. Here are 7 ideas that will help you think about and manage money like a millionaire, regardless of your income.